Simply gorgeous would recommend this product to anyone. 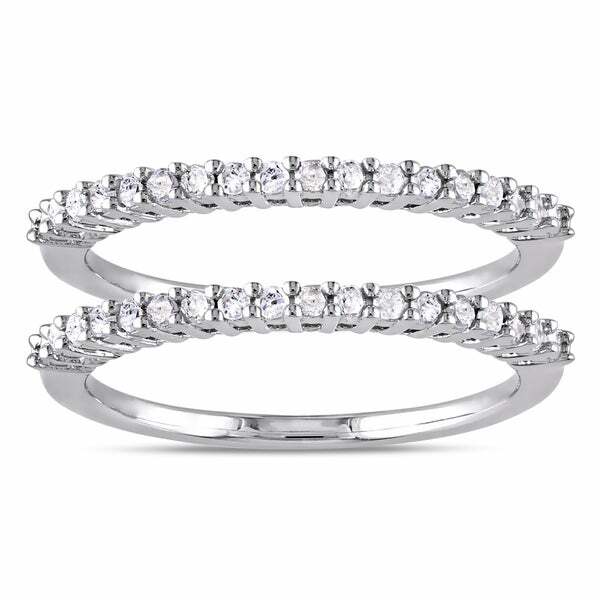 This gorgeous Miadora two-piece stackable anniversary ring set is crafted in sterling silver and features 36 round-cut, prong-set glistening diamonds studded along the top portion of each band. This ring set is perfect for all occasions and even as an everyday statement piece. All weights and measurements are approximate and may vary slightly from the listed information. *T.W. (total weight) is approximate. 3/8 carat T.W. may be 0.34 to 0.42 carat. 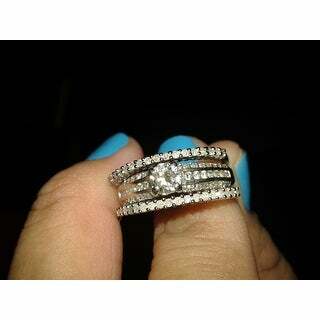 Treatment code N (white diamonds). See Treatment Guide for further information. I am very happy with this purchase. They rings are nice and you can see the sparkle of the stones. They are not accent chips. I needed a small band I could wear daily & I got 2 for the price of one. Diamonds very cloudy or white in color. I choose to return rings. These rings are gorgeous. They are exactly what I needed to accent other rings that I have. I put one on top and the other on the bottom and I have elegant sets of rings that I can switch out for variety.The diamonds are a noticiable size and the silver is polished to look like white gold. This is an excellent purchase for the money spent. Sparkly, but milky white in color. Moves and rubs on my finger so I only wear one. I’m not thrilled with this ring. The diamonds at first appear white. Also, it is very light weight. I may give it some time before I decide to return it. These rings are awesome, the diamonds has good clarity. The sterling silver match perfect with the white gold halo ring i have. The price wasn’t bad and I highly recommend these rings because they come in a pair. Stones began falling out of the rings within the first day of being worn. I am in love with these rings! They are dainty and the perfect size to stack. I bought 3 sets of 2 rings and 6 rings is the way to go! Love my new rings that I will be adding to my wedding rings. The price was amazing for a set of rings. Looks great, lots of sparkles. Fits perfectly! May have to add a third ring to the set. When looking at these consumers need to know exactly what size 1/3 is. These two bands are beautiful I ordered my engagement ring from Overstock also but it’s k white gold so to save a little money I went with silver bands and people can’t tell the difference at all. I have gotten so many compliments I wear them everyday bath daily and do dishes daily and they haven’t tarnished a bit! Great buy! Shipping was fast. The product is pretty. This size maybe a little in accurate. But definitely worth the money. Very nicely made and delicate looking. Bright vintage for it's size as it is a thin band. Exactly what I wanted and you can wear one single of double up for more bling. Would recommend to others. Love the rings. The stones a little smaller than I thought. But the size was perfect, and the shade of silver. They are very comfortable to wear and can be mixed or match most any jewelry. These rings are beautiful. They take some getting used to because the diamonds stick out a little but overall they are very pretty. They are small and dainty and look very classy. This ring set is just the right touch to add a small accent to a larger ring or great to be worn alone. This ring was a great surprise! Excellent quality! To use as ring guards to enhance my ring! Titanium Wedding Bands Explained from Overstock.com. Our guides provide customers with information about titanium wedding bands. Best Reasons to Buy a Titanium Wedding Ring from Overstock.com. Use these facts to decide if a titanium wedding ring is right for you.